After moving to Melbourne for almost two years now, my family and I were able to go down further south west and drive the Great Ocean Road! Generally, we love to visit tourist attractions to witness and admire the magnificence of natural wonders over spending hours sunbathing under the heat of the summer sun while sipping Piña Colada. We like to move around and hop from one destination to the other. 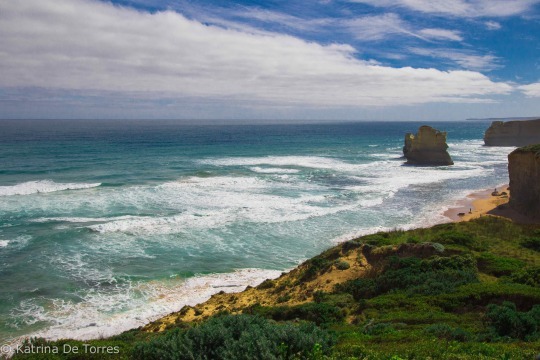 Through the service of Melbourne Costal Tours, we were able to drive all the way from Melbourne CBD and finish the 243km drive of the Great Ocean Road (GOR) Tour just in one day. How awesome is that?! First stop, we headed to the Fairhaven Beach at Anglesea to see a glimpse of the stretch of GOR. We can’t swim though since sharks are having a feast, swimming around this area. A few minutes later, we reached the Great Ocean Road Archway. Where the journey begins! We quickly stopped for a while to have a couple of mandatory shots with the archway. It’s a long day ahead of us. After some mandatory travel photos, w were back on the road. Our tour guide and the entire tour itself was very flexible. We get to have a lot of quick stopovers to have quick glances and photo opportunities along the way. Perks of going in a small group tours rather than joining big companies in huge buses. Along the Great Ocean Road, there were several lookouts on the way where you can have quick stops to have some photo opportunities with nature. The tour guide have chosen Teddy’s Lookout. 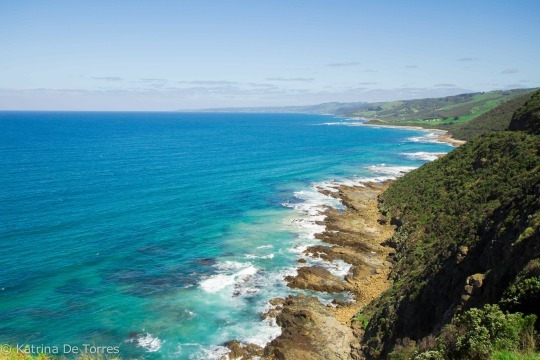 From the lookout, you can see the view of the beautiful town of Lorne and the Bass Straight, the body of ocean between mainland Australia and the state of Tasmania. 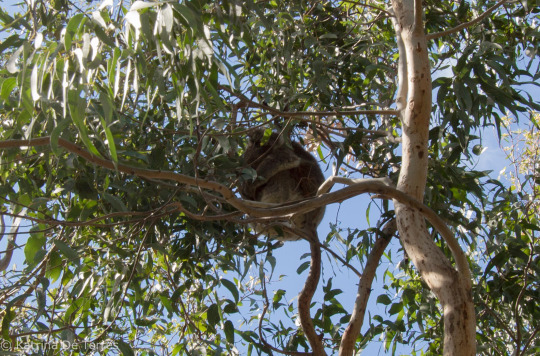 Next stop, we pulled off at the carpark of Kennett River to find Wild Koalas resting on Eucalyptus Trees. We found three of them hugging thin branches on separate trees. They aren’t sociable herbivorous marsupials and sleep at least 20 hours a day. 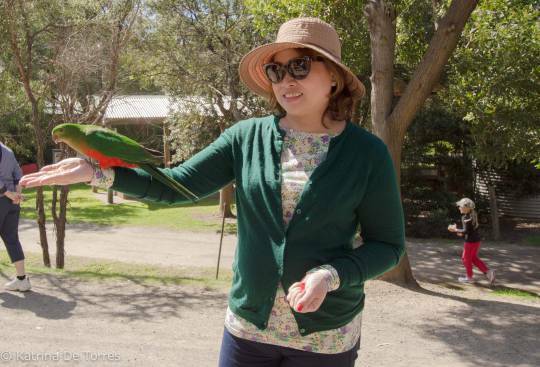 The Australian Government protects their species and touching them would cost you at least AU $10,000.00. Yikes! So better not get too close to them. A picture of them sleeping and their face tucked away from the camera is the most we could do. 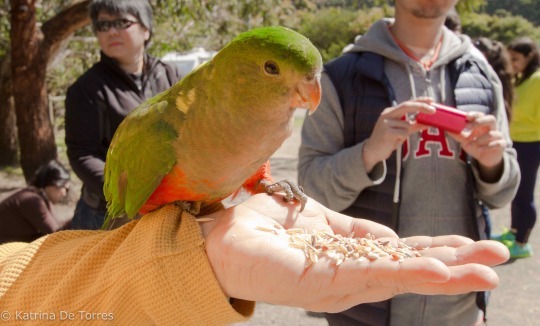 Good thing, a group of wild birds were in the area and our tour guide gave us some bird seeds! These attracted the birds to come closer and be all friendly with our group. Back on the road, we stopped by Cape Patton to look at the view. 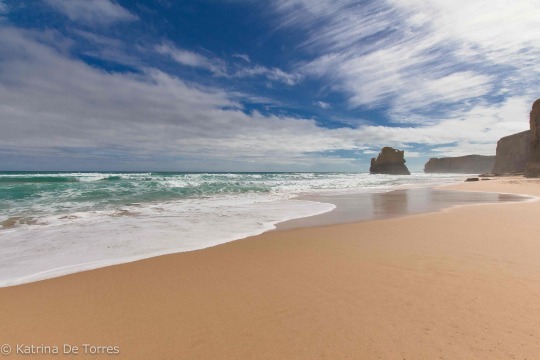 Everywhere you go at the Great Ocean Road, you will see the majestic sea and the powdery sands of the coasts! It’s so consistent. While on our way to our next destination, our tour guide gave us the menu for lunch! Finally. Time to eat soon! We quickly chose what we want for lunch which is conveniently covered by the tour. 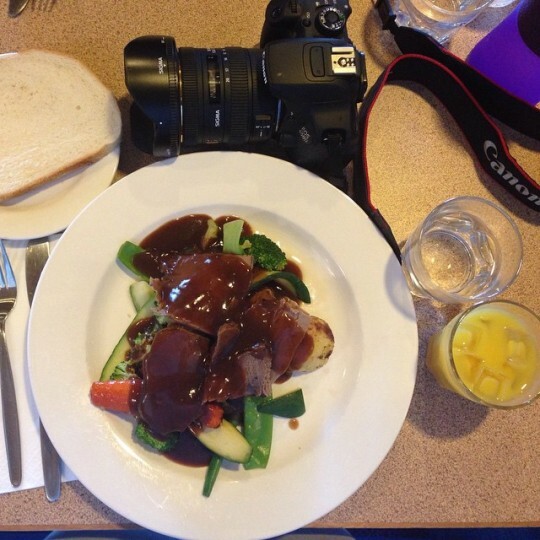 Then we headed to Apollo Bay Hotel at the town of Apollo Bay to have our lunch. All the meals were pre-ordered and were ready as soon as we got there. Cool isn’t it?! I never exerpienced having pre-ordered meals before. Not even in other tours around Asia! The Melbourne Costal Tours did a pretty good job on that one! How convenient! I ordered roast beef with roasted vegetables over Nasi Goreng and Fish & Chips to feel the ultimate Australian experience for the trip and it did not disappoint. At this town, McDonald’s and other modern fast food chains weren’t allowed to operate including the big supermarkets in Australia – Coles and Woolworth’s – in order to support the local businesses of the town. We had a few minutes left to move around and got ourselves local ice cream treats! 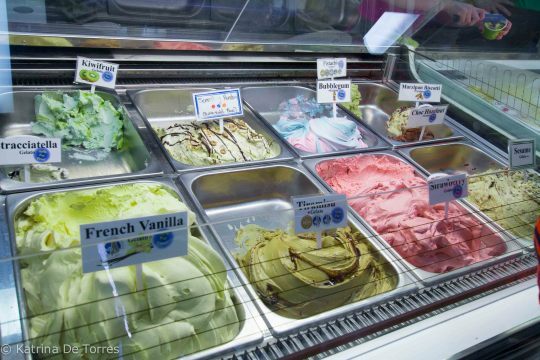 Our tour guide recommended this little ice cream shop just near the hotel where we tried the famous Vegemite Ice Cream – a definitely must try!. Vegemite is an Australian product, food paste, a part of the Australian culture. It’s like butter or peanut butter used to be spread on bread or biscuits. After lunch, we went to Mait’s Rest Rainforest Walk. As part of the tour, a temperate rainforest walk is necessary after all the heavy lunch we dug in. Australia used to be part of the the supercontinent Gondwana before all the seven continents drifted apart. This rainforest still has plant species that are common in other parts of Asia. But in recent decades, Eucalyptus trees are taking over these plant species making the rainforest dry and prone to bush fire during summer. The walking was just beginning. 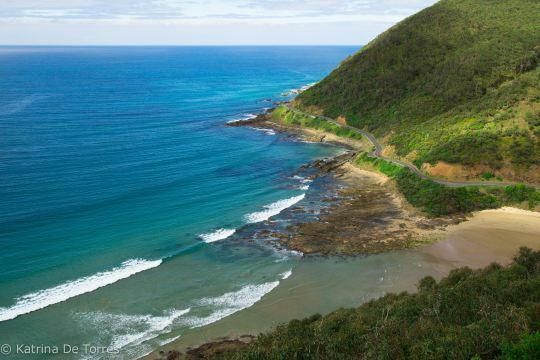 Our next destination is The Great Ocean Walk. We parked beside the road and started walking on the pathway all the way up to the cliffs in order to see the first few of 12 Apostles. Our tour guide asked us if we want to do the 10-minute helicopter tour hovering the Great Ocean. A lot of tourists are doing it at that time. We can see several helicopters flying by the area. For some time, we felt like Bilbo Baggins exploring the lands in The Hobbit with all the hills and grassy fields that surround me. 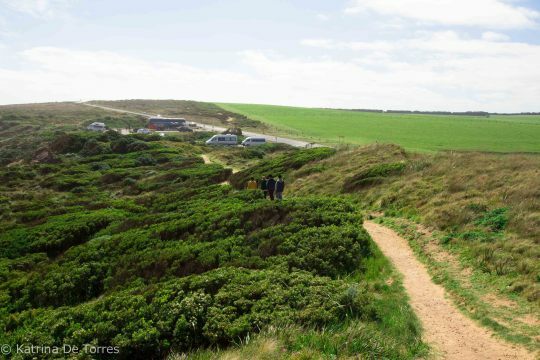 It’s like standing on a cliff in the middle of nowhere! Amazing experience! Not all tours pass by this area though so we felt extremely lucky to have the best tour guide in the area! Our itinerary was carefully and creatively planned. Finally, we reached one end of the walk – The Gibsons Beach. 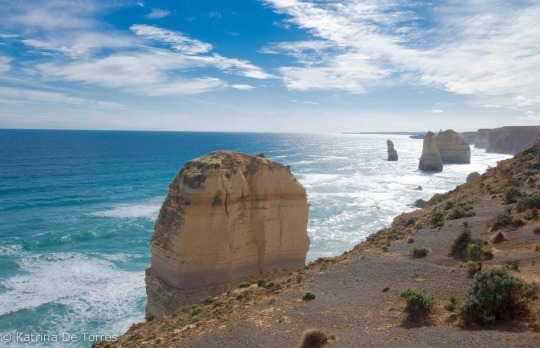 The rest of 12 Apostles can be seen once you continue the Great Ocean Walk. A few more sets of walks and we reached the Salt and Pepper Shakers. The two stacks in the middle were naturally formed by erosion over hundreds of years. Isn’t it amazing?! Other natural formations include The Razorback – the big stack of land out in the sea. The trip wouldn’t be complete without seeing Loch and Gorge. This area is known as the shipwreck area with hundreds of ships failed to set on land in 19th Century. A family nearby is known to have acquired all the treasures from the ships carrying them from the coast up to the cliffs. 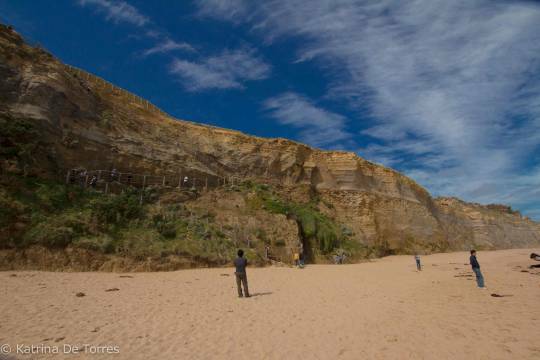 Imagine how they managed to climbed the cliffs in 19th Century! There used to be a heroic shipwreck in 1878 where an English man and an Irish woman survived. Last stop was the famous London Bridge. It acquired its name after its similarity with the real London Bridge without knowing it will fall down too! In 1990, a couple was trapped in that stack in the sea after crossing the 15-metre wide bridge that used to connect the mainland to that stack. It wasn’t 000 (Au emergency hotline) that came to the rescue. It was actually the Channel 7 (media) that went here to cover the collapse of the bridge and made a huge dramatic story out of it. After spending our entire day out on the road, we had to leave and go back to the city. It was a wonderful experience getting in tough with nature again. ^^ Especially when our cardio were tested with all the walking uphill and downhill that we did. 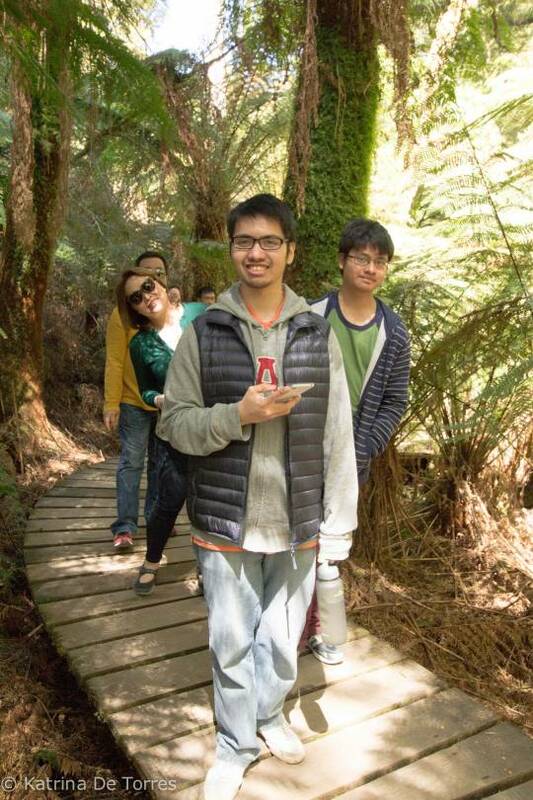 And of course, the trip wouldn’t be this amazing without the awesome planning of Melbourne Costal Tours. I’ve always liked those companies that offer quality service rather than big companies that can’t consistently provide the service they promise to do. Mikaela expresses her thoughts, dreams and creativity through different forms: drawing, painting, writing and photography - to positively inspire people to appreciate art and explore the world.